Does it feel as if your holiday break never even happened because you're already getting overloaded with work to grade? Would you like to reduce the time you spend grading? Most of us assign work for two reasons: 1) assessing learning 2) collecting data for grading purposes. So in theory, we want the work we give to help us measure mastery of important skills and knowledge, and help us give accurate grades. 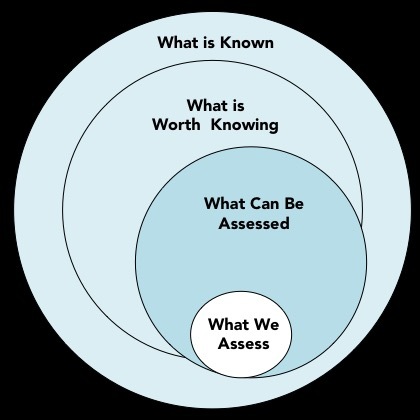 The problem is that not every question on an assignment is equally valuable as an assessment of learning. I’m going to share a strategy that will help improve the accuracy of your grades AND reduce the amount of grading you have to do. Lead Up Questions – These are questions that help students go through a step-by-step thinking process that will help them answer other questions. Or they can be questions that are written for the purpose of making sure students complete a reading assignment or stay on task during a film in order to be able to answer other questions. They are questions that don't address critical skills or content. Target Questions – the questions that require a student to demonstrate an understanding of critical content or the application of critical skills, often as a result of having completed the lead-up questions. For purposes of grading, we should focus on the target questions. But usually, when we grade assignments, all of the questions on the assignment would be treated as if they were equally important. 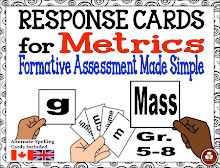 That can have bad effects on the accuracy of grades as a measurement of mastery. Here's why. Suppose a worksheet has 10 questions on it. Suppose that only two of the questions are target questions. One student might answer correctly eight of the questions on the worksheet but answer the two (most important) target questions incorrectly. You’d enter 80% in your gradebook. But did that student demonstrate 80% mastery of content? Or just 80% accuracy of answering the lead-up questions? Another student might only complete five questions, but answer all of them correctly, including the two target questions. You’d enter 50% in your gradebook. 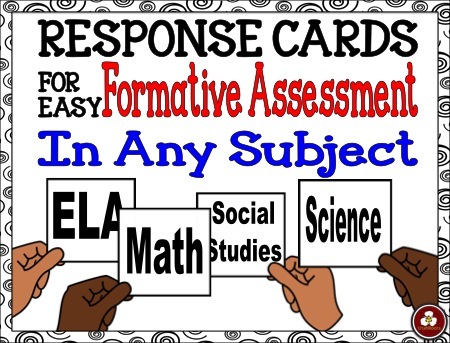 Does a student who correctly answers the two most important questions - the ones that really require a demonstration of mastery - really deserve an "F" for the assignment? And would that "F" be an accurate measure of their mastery of the most important content? Which of those students really understands more of the critical content? And will their grade reflect it? Not all questions are good assessments of mastery. If you include all of them in a grade, you’re diluting the accuracy of the score as a measure of mastery. So here’s something to try. It’s not a silver bullet. You shouldn’t use it with every assignment. And it won't suddenly make all of your students do all of their work. But used judiciously it will improve the accuracy of your grades and may also have the effect of improving turn-in rates for assignments. 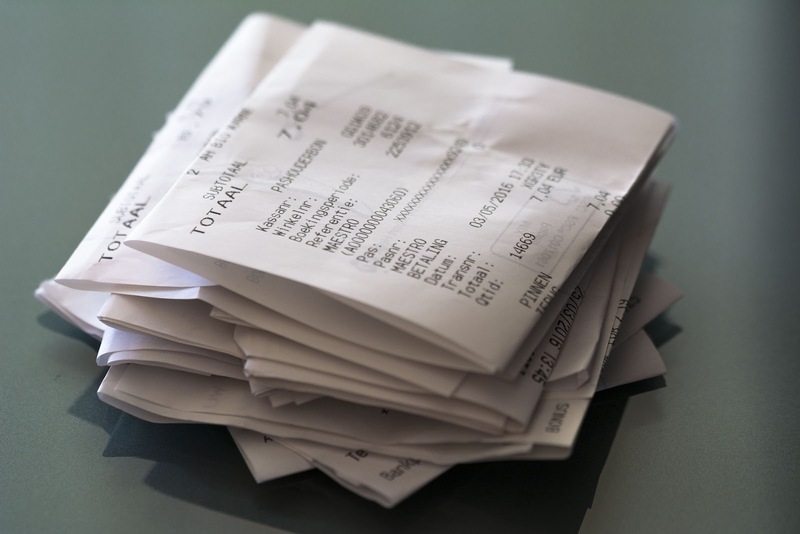 And it will definitely make grading less time-consuming and more efficient for you! Create a half-sheet form like the one pictured. If you subscribe to my email list before 01/11/2019, I'll send you the form. 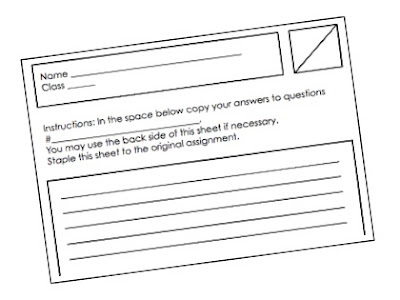 The form should include the student’s name, class, and an area for writing answers. The half sheet form will be stapled to the front of a completed assignment. 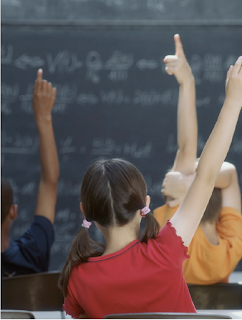 Prior to the beginning of class, identify ­target questions from the previous day's assignment. Try to limit the number of questions to four or fewer. Give students a very short amount of time to copy their answers to those selected questions onto the half sheet form. You shouldn’t allow more than a minute or a minute and a half for students to do this. That’s enough time to copy answers but not enough time to hastily attempt to write the answers that aren’t already written down. And since you’re watching them while they complete the half sheet, they’re unlikely to cheat right under your nose. You grade only the questions on the half sheet and enter that score into your grade book. If you feel strongly that a grade should reflect responsibility as well as mastery, you could give points for having completed the entire original assignment. Just be thoughtful about doing that because it dilutes the accuracy of grades as a measure of content/skill mastery. The reason you don’t use this strategy with every assignment is that if you do, some students will start trying to guess which questions you’re going to select and will only answer those. And you certainly wouldn’t use this strategy to score quizzes or tests. But when you know that not all of the questions on an assignment are equally important, and if you are buried by paperwork, this strategy will really save you time and improve the accuracy of your grades as a measure of mastery. If you use this strategy, you will probably find that a few students actually do more work for you. I wish I had a nickel for every student who didn’t turn in an assignment because it wasn’t complete and they know they’ll get a failing score whether or not they turn it in. It’s a shame that students feel that way, but they’re right if the teacher scores every question. With the strategy I’ve described, students have a chance of getting better than a failing score if they’ve answered even some of the questions you selected for scoring. You’ll also find that some of your really bright but unmotivated students who refuse to do what they consider to be “busy work” will probably at least do some work if the odds are that doing some of it is going to pay off for them even if they don’t do all of it. Getting kids to do some of the work should always be a goal when the alternative is that they do none of it. This process, used judiciously, gives you what you need for assessment, improves the accuracy of grades as a measure of mastery, and honors the work that students have completed while reducing the time you spend grading less meaningful work. You might even have an occasional weekend free from grading! Giant Back To School Giveaway! There's SO much to do before the first day of school with kids! Things just keep being added to your To-Do list, don't they? And it seems like nothing gets taken OFF of your plate. For every item checked off your list, three more seem to appear. And somehow, the last thing to get done is lesson planning for that first crazy week. Rest easy. 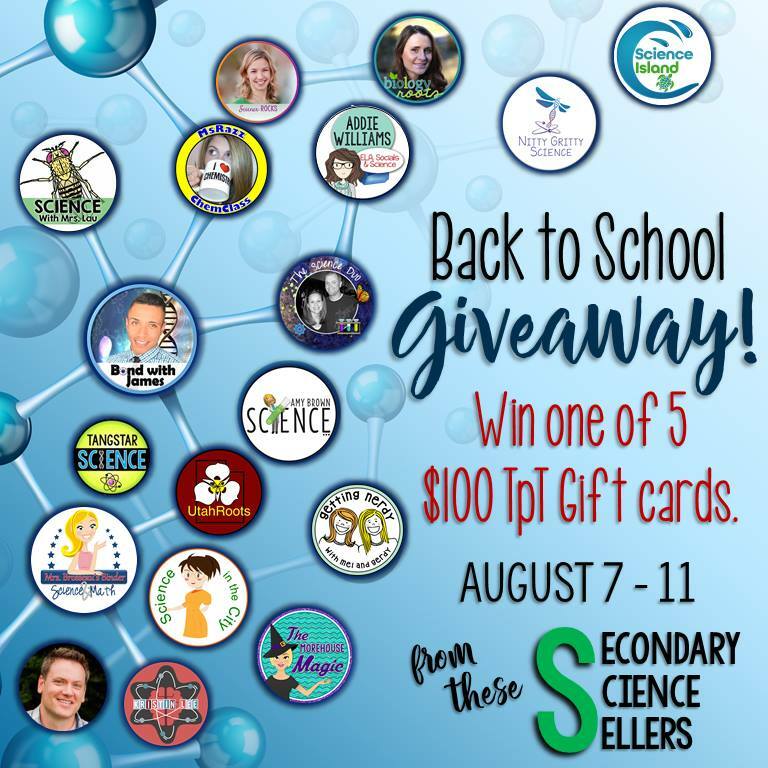 A group of secondary science teachers who have Teachers Pay Teachers stores are joining together to make things a little easier. Whether it's a first-day lesson plan idea or your first full unit of lesson plans, you can find it in the TpT stores of this group of teachers. And we're giving you the money to do it. We are giving away FOUR $100 TeachersPayTeachers gift cards that you can use in any store on TpT! How to enter: You need to hop from blog to blog to collect secret words that form a sentence. When you have collected all the words for the sentence, click on the Rafflecopter box on any of the blogs and type in the secret sentence words in the correct order. We will pick four winners after it ends after midnight on Friday August the 17th. My Secret Word is #15 in the sentence. It is: "the". Structure of DNA Guided Graphic Notes. Enter the giveaway for these bundles here: a Rafflecopter giveaway Giveaway ends August 17th, 2018 at 11:59 PM EST. Open to Residents of the earth only. Winners will be selected at random and be notified by email. Winners have 48 hours to confirm their email addresses and respond before a new winner is selected. The product offered for the giveaway is free of charge, no purchase necessary. My opinions are my own and were not influenced by any form of compensation. Facebook, Twitter, Pinterest, and Instagram are in no way associated with this giveaway. By providing your information in this form, you are providing your information to me and me alone. I do not share or sell information and will use any information only for the purpose of contacting the winner. What To Do With "Fast Finishers"
There is absolutely nothing worse than running out of lesson before you run out of time. And it's completely impossible to design lessons that every student will complete at the exact moment class ends. There will always be "ragged time" with some students having finished early. So how can you plan for fast finishers and keep them engaged? Here are some ideas. 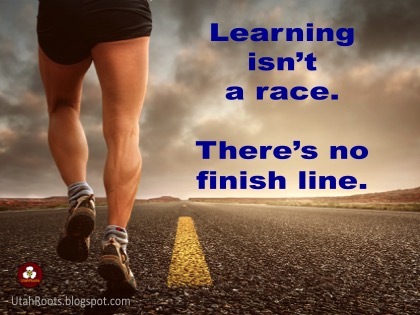 Some students finish quickly because they equate finishing first with being smartest. Some finish quickly because they put little effort into accuracy or completeness. And of course, some finish quickly because the work didn't challenge them. So the first thing to do is to establish an "evidence of excellence" rule. Ask the fast finishers to show you in their work some "evidence of excellence". If they can't show you where they have done excellent work, send them back to work until they can. But if they are really finished and can show you excellence, then it's up to you to give them work that is worth doing and that respects their abilities. Secondly, establish the motto that "Learning isn't a race. There's no finish line." But once you establish that nobody can be "finished" learning, it's your responsibility to give them something worth learning. It's important that your truly gifted students don't get "punished" with more of the same work other students are doing or they'll just make sure they don't finish early. What a waste of valuable learning time! The ideas I'm suggesting below work for all kids because they have an element of fun that makes them engaging and attractive to students who finish early. In my classroom, I used what I called Anchor Activities. They are independent activities that were always available and required no equipment or special supplies. In my class, they were geared to take about ten to fifteen minutes to complete, required only paper and pencil or simple manipulatives that were laminated and stored for easy student access. Most were independent but some could be done with a partner. They were tied to what we were learning so they changed with every unit. And most importantly they are engaging. Here are a few of them. Vocabulary Dominoes. Basically, it's a matching game. Finished correctly the "dominoes" will line up with a vocabulary word on the end of one domino matching its definition on the end of another domino. Students may work alone or in pairs. The student doesn't turn in anything. You check their work at their desk when they're finished and record a score. I print sets on different colors of cardstock so it's easier to make sure you don't get sets mixed up. I store them in zip-close bags. 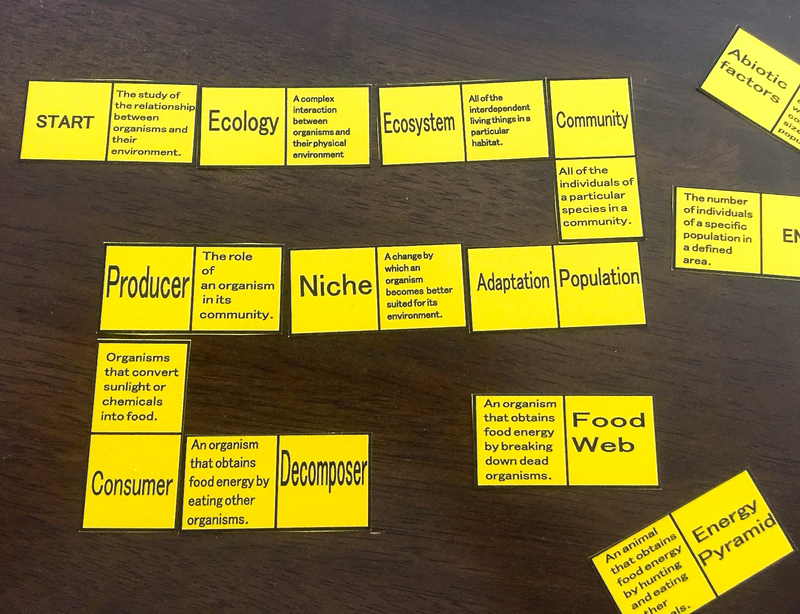 To the right is a picture of my ecology vocabulary dominoes in action. They are a bit time consuming to create but having a few sets on hand as anchor activities for different units is SO worth the time it takes to make them. Root word task cards. 90% of scientific vocabulary is based on Latin and Greek. The more opportunities you give students to practice learning the root words the better. When they practice the root words they will eventually get to the point where they can work out a reasonable attempt at the meaning of science vocabulary word the first time they see it. Root word task cards are hard to beat as an anchor activity. Students can work in pairs or alone. They answer the question on the card and turn in their answer sheet. 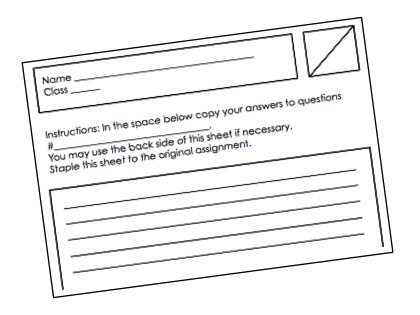 If you have a quick turn around time on grading, you could laminate a few copies of the answer sheet to reduce the amount of paper you use for anchor activities. 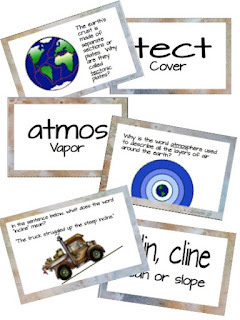 To the right are some sample task cards from my Earth Science Root Word Vocabulary set. 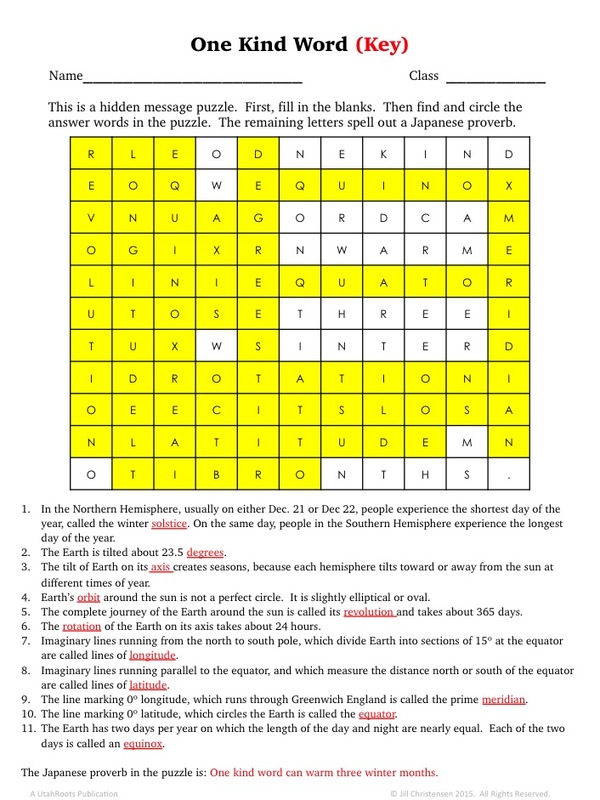 Hidden Message Puzzles. I find few things less valuable for learning than wordsearch puzzles. And for students who struggle with reading, wordsearch puzzles are just aggravating and difficult. But you can remove barriers for students with disabilities, and easily turn word search puzzles into something that has more educational value simply by making them into a hidden message. You create these. They're pretty easy to make. The completed puzzle is turned in to you. Don't require students with reading disabilities to find the words in the wordsearch. It's pointless and not fun for them. They fill in the blanks to get full credit. Other students will enjoy finding the hidden words in the word search. You don't have to announce that not everyone is required to find them. Just quietly tell the students with disabilities to fill in the blanks first and you'll give them credit without the puzzle. Pictured to the left is the teacher key for a free hidden message puzzle in my Teacher's Pay Teachers' Store. 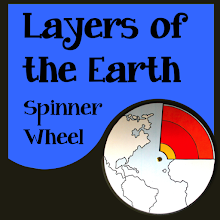 I made it for use on the day of Winter Solstice, during an Earth Science unit. The yellow boxes are letters that are "used up" by answering the questions. 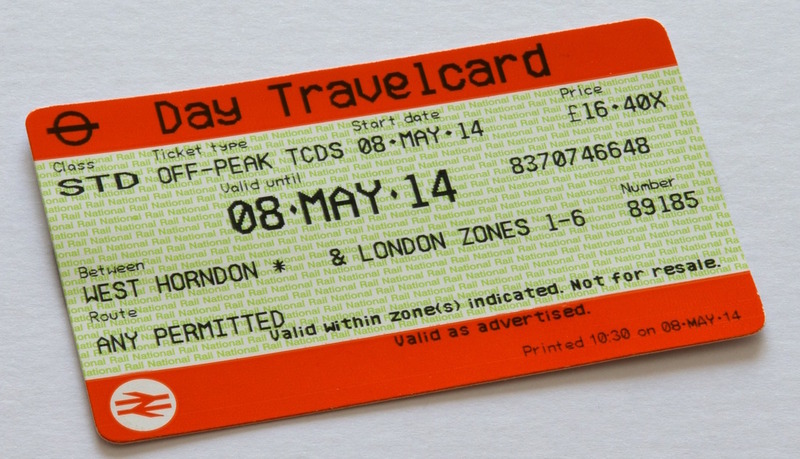 The remaining (white) unused letters spell a hidden message, "One kind word can warm three winter months". If you want to try making a hidden message puzzle, create a table on a Word Document, PowerPoint or Keynote slide. Write the fill-in-the-blank questions first. Format the cells of the table so that the letters are centered both horizontally and vertically. Enter the letters for the vocabulary words. Then fill in the remaining squares with letters from a short quote you like. Non-fiction reading passages. If your school requires that you support English/Language Arts standards for reading and writing in science, this is how you do it painlessly and still have time to teach your own science curriculum. Use non-fiction reading passages as anchor activities to give students practice with reading informational text. That's just as important in science as it is in Language Arts. You can make your own (with accompanying questions) from an article that matches your students' abilities and interests. I'll be sending a free reading passage about The Radium Girls to my email subscribers soon, so if you'd like it, be sure to sign up for the email list! 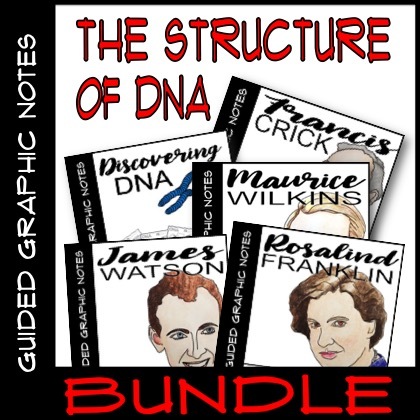 Take a closer look at it by checking out the preview of the full resource here. Color by number review. Color-by-number review activities are among the most engaging ways to keep your early finishers happily working. 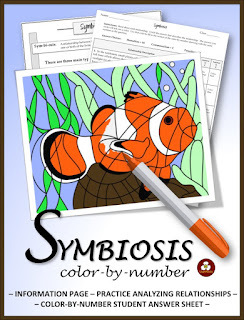 Pictured is a color by number resource for reviewing symbiosis. If you can write a multiple choice quiz, you can make your own color by number review activity on ANY topic using these free editable color by number pictures. Instructions are included. And talk about easy to grade! Nothing is easier! See some more ready to use no-prep color by number resources for science here. By the time students hit middle school, they won't do extra work if it doesn't affect their grade. That's just reality. It's sad but I can't say I blame them. So in my classroom, I did require a certain number of points from anchor activities each term. 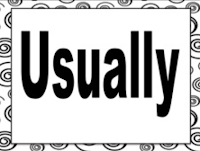 That put a little bit of pressure on students to stay on task regularly so that they could have ten minutes here or there for anchor activities. 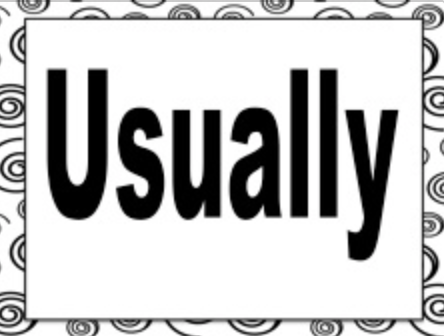 For my students with disabilities who sometimes struggled to complete their regular work and might not have time for anchor activities, I would just quietly adjust the requirement on a case by case basis. The number of activities I required depended on how much time I anticipated that a typical student would have to work on them during the quarter. Usually, I required six or seven activities per quarter. But I hate grading papers. I would rather wash every toilet in the school by hand than grade every answer on 7 pages of anchor activities for 185 students! So I graded on a four-point scale: 1-4 which basically equates to a GPA scale but didn't require that I read every single answer on every single activity or give a direct point value to match the number of questions. You can tell at a glance if something is barely an attempt (1 pt. ), has some effort put into it (2pts), is nearly complete or near mastery (3 pts), or represents mastery (4pts). The important thing is that anchor activity points should not have an inordinate effect on a letter grade. I found four points each to be the sweet spot but, of course, that sweet spot will be different for you. I personally would allow students to do extra anchor activities at the end of a term (IF their required work was completed on time). I hope that these ideas and freebies will give you a start on creating your own anchor activities. Don't forget to think about things like crossword puzzles, logic puzzles, and other kinds of valuable and mentally stimulating activities to keep your "fast finishers" on task! Every time I spend seven hours in a professional development workshop it changes my teaching for at least a week. I guess I need frequent reminders that human beings are not meant to sit in a hard chair for seven hours with occasional restroom breaks and a 30-min. lunch break. It's interesting that when we are in the role of students, we call it a good day when there's lots of opportunity for movement, group work, and a little fun in our work, but we don't provide those things for our students as often as we should. I love doing gallery strolls and using task cards to get students up and moving. I'll try just about anything to get kids out of those terrible hard seats for a while. I'm super excited about the potential for learning with movement in the recent phenomenon of Escape Rooms. It's a perfect time to try one yourself! The basic idea is that student teams work together to compete against other teams to be first to finish a series of tasks, each of which gives them clues they need to complete the next task leading to a final opportunity to use every clue for the last task and the escape! When kids have spent all day taking tests they will really appreciate and enjoy a chance to chat, laugh, and move around in a "gamified" activity. And if year-end testing is over, then an Escape Room is a perfect way to combat the "we can stop learning now" attitude we often see in middle school kids in the final few weeks of school. 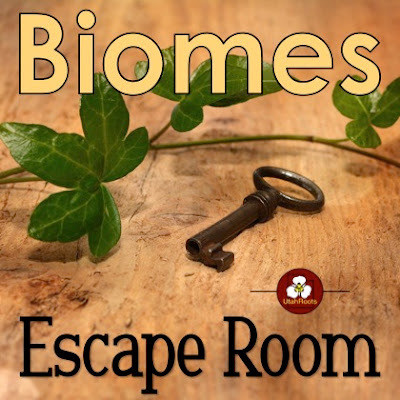 I'm happy to introduce my first Escape Room, and hope that the topic - Biomes - will be a perfect theme for this time of year in your class! There is nothing worse than going to a website and having access blocked or interrupted by pop-ups. And you're about to see one. Sigh. 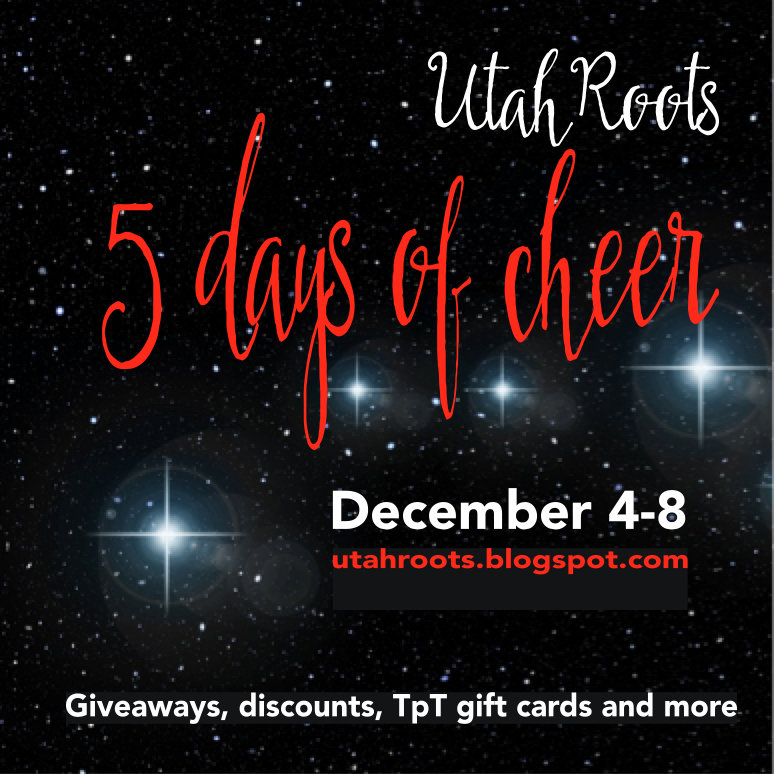 So many wonderful people have followed my UtahRoots store during the last five years, but I have no way of knowing who you are. I don't get to see the names or email addresses of anyone who follows my TpT store, and so there's no way for me to thank you or send you freebies as tokens of my gratitude. 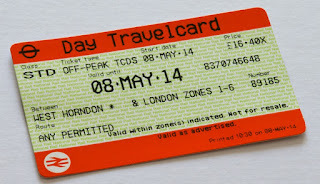 So that's why I've started an email subscription list here on my blog. If you sign up, I promise that I won't bother you frequently with emails and that when you do get an email from me it will be to let you know about a giveaway, a freebie, or some other benefit of being one of my email subscribers. 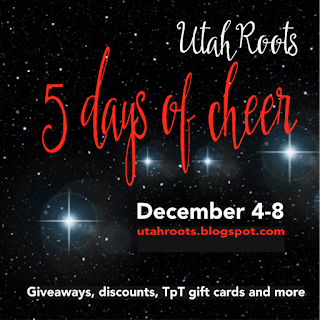 And I hope that if you aren't already following my UtahRoots store, you'll choose to do that too!